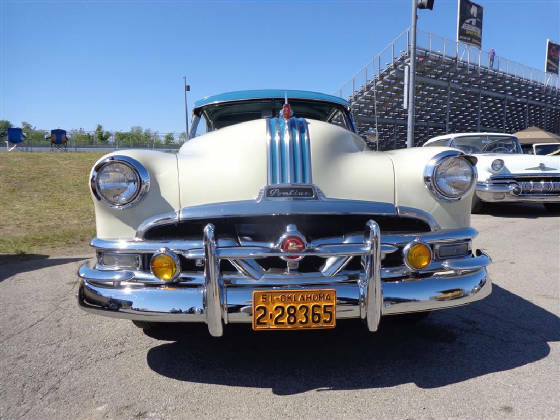 Several members of the Cimarron Starlite Cruisers Car Club went to Tulsa on May 3 to attend the Pontiac Nationals hosted by the Indian Nations Chapter of the Pontiac Oakland Club International. 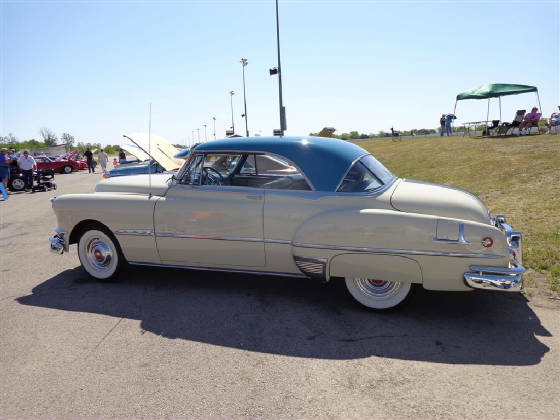 The Pontiac Nationals are held each year at the fabulous Tulsa Raceway Park located at 3101 N Garnett Road, Tulsa, Oklahoma. This event is billed as a Buick, Olds, and Pontiac Challenge which includes a great car show and lots of drag racing. The event attracts vehicles from several states. 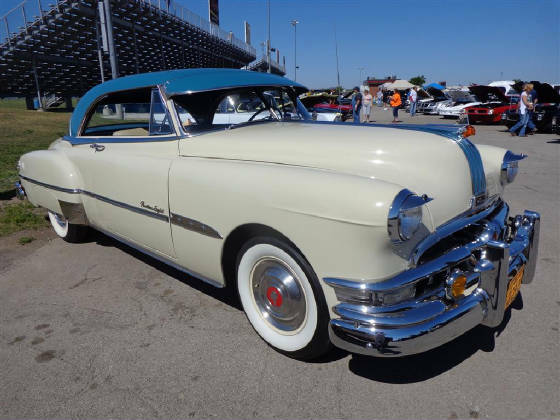 Upon arriving at Tulsa Raceway Park we notice this outstanding 1951 Pontiac Catalina owned by Jim Roberts of Glenpool, Oklahoma in attendance and ask if he would be willing to share his classic Pontiac with our website followers. Jim’s Pontiac Catalina is truly a gem! Jim has owned the classic Pontiac for the past thirty years. He found the Catalina back in 1984 while driving around Tulsa looking for parts for an old Chevy he was working on. Jim had just purchased the Chevy for $750 and was not looking for another project. But there it set in a drive way with a For Sale sign on it. 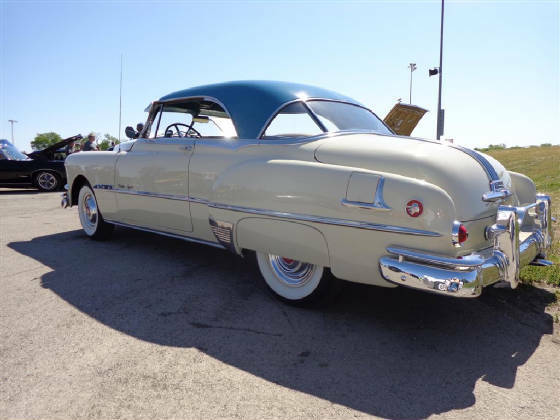 Jim’s heart did a flip because he had not seen a 1951 Pontiac two door hardtop since he graduated from high school in 1959! The classic Pontiac had no rust was in pretty good original shape. Jim put on his car trading face so the owner did not know he was very interested in the car. After several walks around the car and lots of looking Jim paid the owner $1200 for the old classic, which was the beginning of another Pontiac love affair. Notice the newly acquired 1951 Oklahoma license plate with the correct 2 for Tulsa County. Also, notice the correct Pontiac bagging in the center of the grill, rare indeed to see one of these. When Jim was in high school his sister owned a Pontiac just like Jim’s pride and joy. Jim’s sister would let him drive the Pontiac on Saturday evenings to “Drag Main” in his home town of Stillwell, Oklahoma. 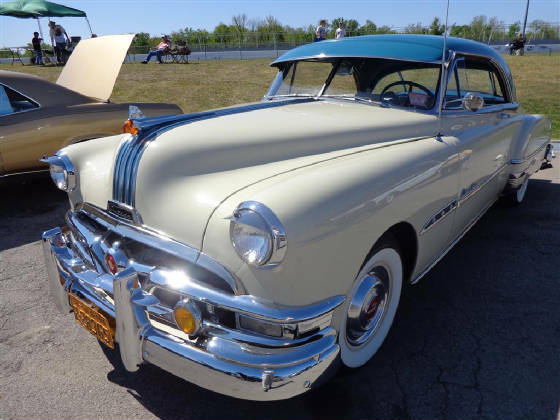 The engine of this 1951 Pontiac Catalina is a Pontiac 268 cubic inch straight eight flathead which produces 120 horsepower and 220 pounds feet of torque. 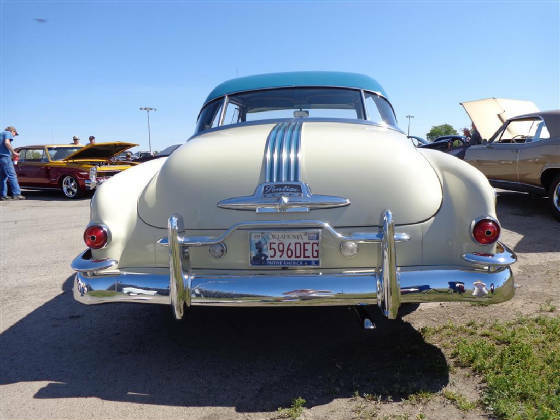 The Pontiac 268 was produced from 1950 thru 1954. 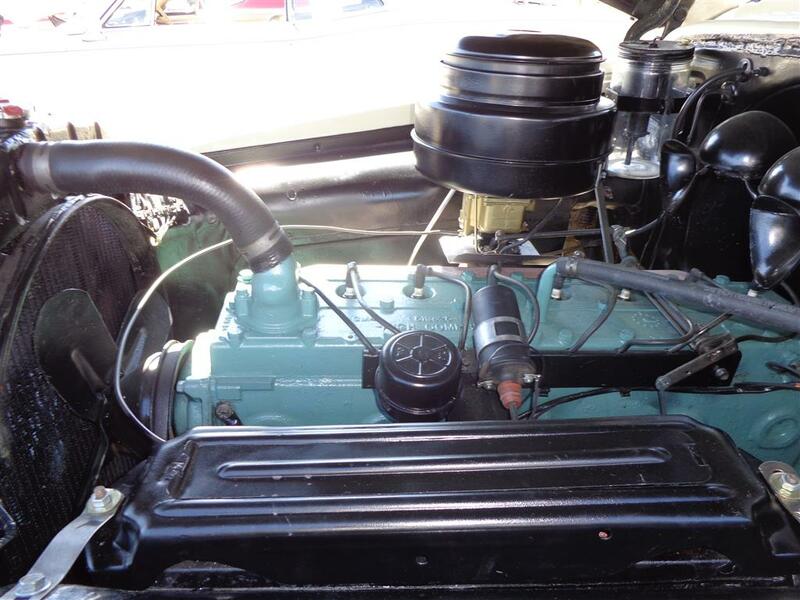 The power is applied to the rear end through a Pontiac Hydro-matic automatic transmission. The electrical system is the original six volt system with all the original type wiring and connections. 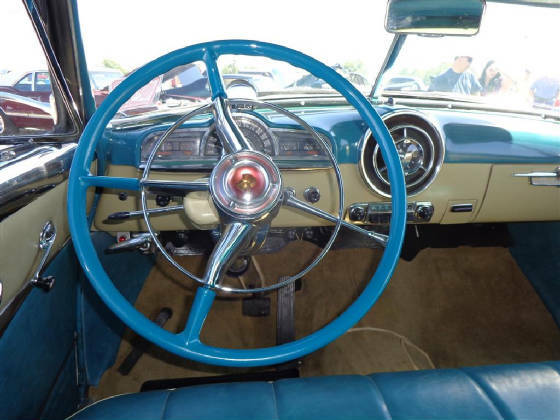 The dash in Jim's classic is just wonderful, just like it left the Pontiac assembly plant so many years ago. 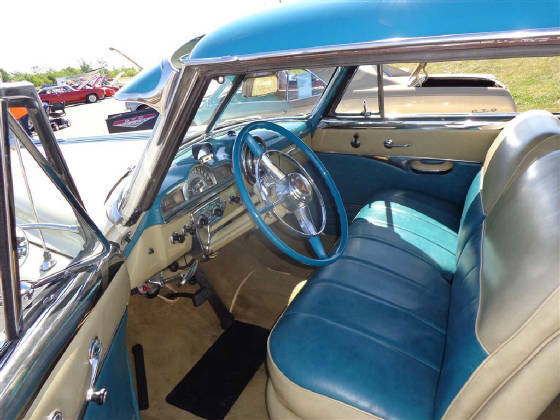 As you can see, the interior of this Pontiac classic is just beautiful. As with most classic car lovers, Jim’s Catalina has been a steady work in progress and he is never happy unless he can upgrade this beauty with quality original parts. Jim has done a lot of restoration work himself and with friends. He has purchased parts from all over the USA. He worked with Glenpool Body Shop to do the wonderful Teal over Malibu Ivory paint and body work for this Pontiac classic. This classic Pontiac Catalina rides on a set of 710 fifteen inch white wall tires. Jim says he is looking for a cemetery that will let him be buried in his pride and joy! 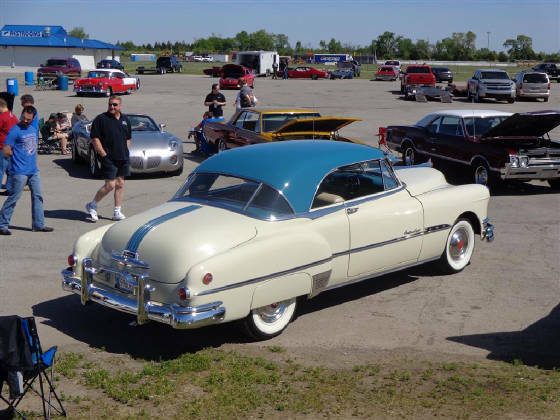 The Cimarron Starlite Cruisers sincerely appreciate Jim Roberts for sharing his beautiful classic 1951 Pontiac Catalina, a real string of pearls!